Rice Kheer/ Rice Pudding is a popular Indian dessert. It is served during most of the special occasions. 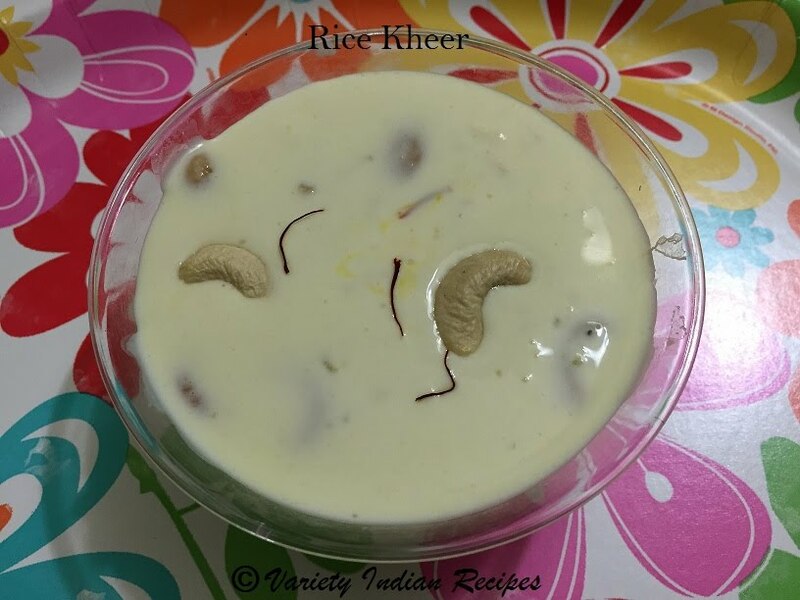 Rice Kheer is a creamy pudding cooked with milk and sugar flavoured with cardamom, nuts and saffron. It can also be made with left over rice. It can be served both hot or cold, both tastes excellent. In a non stick pan, pour in the milk and allow to boil. When milk is in the boiling consistency, add the cooked rice and stir well. Simmer and stir frequently until milk reduces to half the volume. Once the milk gets reduced, add sugar and stir for about 3 minutes. Add the Cardamom powder(elachi powder) and stir well. Crush saffron and add it to the boiling milk. Add in the nuts and stir well and allow to boil for 2 minutes. Tasty Rice Kheer is ready. Turn off heat and serve hot or chilled by refrigerating it.